How technology can help improve education. Improving education is a huge issue (and always has been). Test scores, our perceived performance against other countries, and other factors have pushed education to the forefront of national politics, right behind healthcare reform. Technology can be used to improve teaching and learning and help our students be successful. While smaller schools and class sizes are always desired, technology can not do that physically. However, technology can be a “force multiplier” for the teacher. 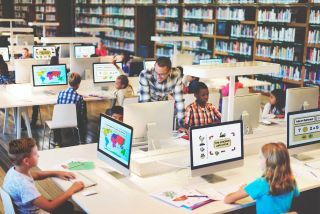 Instead of the teacher being the only source of help in a classroom, students can access web sites, online tutorials, and more to assist them. Education doesn’t stop at the end of the school day because students have access to teachers, resources, and assignments via the web and access these resources at any time. Students can also get help and tutoring at any time, whether from the teacher via email or online collaboration, or from a help web site. Parental involvement is another factor that can increase student achievement. Most parents these days have extremely busy schedules, work different hours, and can’t always help their child with homework or come to school for conferences. Technology can help. Parents can go to a class website and see what their child is working on, they can contact teachers via email and web sites, and they can even check their child’s attendance and grades through online systems. They can also talk to their children from work via email and instant messaging. Inquiry based projects are another way to get students to think rather than memorize. These group projects also help students build important skills such as communications, team work, critical thinking and problem solving. Technology can help with these projects and skills. Students can create things such as web sites, blogs, and multimedia presentations as part of their project. They can use the web for research and as a resource. They can connect with students at other schools and do collaborative work with them. They also learn technology skills while doing these projects. Money is always an issue in education and technology can help. Virtual field trips, electronic forms instead of paper, email instead of printed memo’s, virtual labs, electronic textbooks, and the thousands of free online resources can all save schools money and give students excellent educational experiences. Teachers can use technology to find resources and attend virtual professional development seminars and conferences (most are free). They can also create personal learning networks (PLN) with Ning, Twitter, and other resources to find and share ideas and resources, and get support from their colleagues.